AdminXP.com: FTP. Secure FTP / FTP TLS. FileZilla. FTP (File Transfer Protocol) - One of the TCP/IP Protocols used for file transfers on Internet. Alternativelly, WebDAV or some other programs can also be used. The protocol belongs to the application layer of the OSI model. Website Update - Websites are created on a computer and then transferred to the FTP server of the webhosting provider. FTP archives - Servers with large amount of files available for download (usually shareware). File Exchange FTP servers - Servers enabling users to exchange or share files. Some users tend to look for P2P networks where connected users can share their data and provide it to other users for download. However, FTP and P2P are incomparable. In easy words - FTP is always available with the same content, while on P2P networks the users, content and availability change. FTP Server - A computer on local network or Internet which runs the FTP Server program. This program allows FTP Clients to connect to the server. According to the program's options, you can create users, limit access to particular folders, enable or disable file upload to the server or allow access only to computers with defined IP addresses. 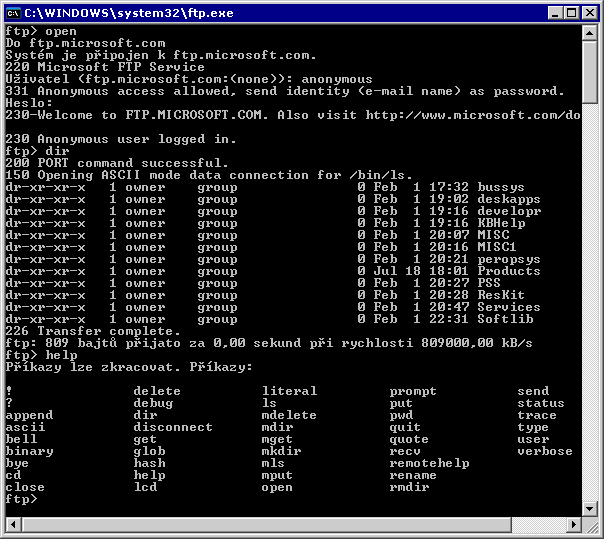 FTP servers run on various platforms which have varied features, e.g. on UNIX based servers, the file names are case sensitive. 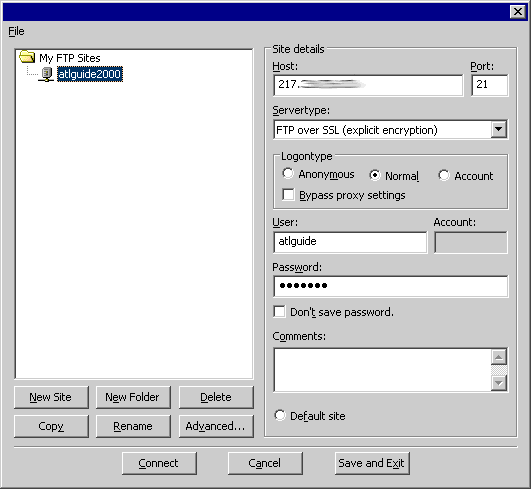 FTP Servers requiring login - Servers requiring name and password to login. They are used in company networks and on webservers for website updates. Users and user groups can use these servers as data storage; then, the data is available on any of their computers connected to the Internet. There also exist pirate FTP servers that contain illegal copies of films, games and music. They usually require a name and password and are limited to a certain group of people. It is often required that each users uploads some data to the server and according to the amount of uploaded data the user is allowed to download (e.g. you have to upload 1GB of data to the server to be allowed to download 5GB of data). Public FTP Servers with anonymous access - These are usually servers providing HW and SW products and allow anonymous access. "Anonymous" is the user name and your e-mail address or an empty field is used as the password. Data upload is usually not allowed at all (there can be an exception - if there are folders named "upload" or "pub"). Access to the server can be limited by a maximum number of users who can be concurrently connected. You can find the list of anonymous FTP servers here: www.ftp-sites.org. Internet browsers with file links published on websites are the most frequently used ways to download data from these servers. FTP Client - A computer or software used for connecting to FTP servers. Windows only contains a very simple FTP support through the command line or the Address line in the Internet browser. If you need to transfer larger amounts of files, it is recommended that you use a specialized FTP Client. Then, the connection to the server and downloading or uploading files is very easy, even for less experienced users. We provide a link to the best-known FTP software, as well as an article with examples and instructions on how to use FileZilla. WebFTP - A Service providing access to FTP servers through web interface. WebFTP provides some interesting basic features, such as download, upload and viewing. Deleting, copying and transferring directly on the server is a standard. There may also be some advanced features available, such as used space information, compression support for transfers to the server, searching and editing options. However, there can be some disadvantages as well, e. g. working with them is slower than in other Clients and users are not usually allowed to transfer multiple files to the server at once. Secure FTP - Secure FTP supports encryption upon login and during communication with the FTP server. If FTP is not secure, the login name and password are transferred within the network in text form which means that another user could detect and abuse this information. The encryption method must be supported by both, the server and the Client. Some other terms are related to secure FTP, such as AUTH SSL, SFTP, FTP TLS. >SFTP (SSH2 File Transfer Protocol) - used to connect to an SFTP server using an encrypted connection (tunnelling a normal FTP session over an SSH connection - usually port 22. It should replace the older SCP protocol - Secure Copy Protocol). Resume Uploads/Downloads - This feature allows you to continue where your last download or upload stopped after having been interrupted. This feature must be supported on both sides. Queue - Transfer commands can be saved in queues and executed later. Without saving your transfers in queues, you have to wait until one command is finished and then start another one. Drag&Drop - This method is well-known from Windows and is also implemented in some FTP Clients. You just need to drag the chosen files and drop them in the appropriate part of the program. FXP (File eXchange Protocol) - Defines a direct transfer from an FTP server to another. Data travels directly without the need of downloading it to the Client computer and consequential sending to the target server. If the Internet connection is slow, the Client computer can significantly slowdown the transfer. The FXP Protocol must be supported by both FTP servers that participate in the transfer. Other - various graphic interface, pre-defined lists of interesting FTPs, time schedules (defining when the transfers should be executed) etc. password * password is usually "guest" or e-mail address. But more often, no password is needed to enter. port * number of the TCP communication port. If the standard 21 is used, there is no need to enter it. This is an example of a common company or related website's address provided by a public server with anonymous login. The installation itself does not need any explanation. The installer executes the installation and provides necessary information. There is just one speciality - you can set the secure mode (program will not remember your password) and the option whether you want the passwords to be saved in the system registry or an XML file. Site manager allows you to create and manage your connections. You do not need to remember your login information. To create a connection, choose New Site, fill in data given to you by the FTP administrator and save. Next time you start the program, you can just choose the connection shortcut from the list. Connect to the remote FTP server and in the right part of the window, choose a folder to which you want to transfer files. In the left part of the window, choose local computer and define what you want to transfer, then choose Upload. If you want to transfer a file from the server, go to the left part of the window and choose where to save it and in the right part choose the files to download. After having mouse-clicked the marked files, choose Download. 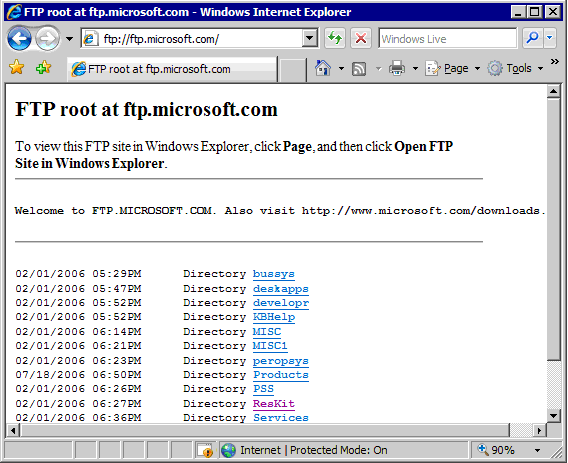 Windows provides access to FTP through the Internet Explorer or command line. This is the fastest way to connect, however, if you need to access FTP frequently or you need to transfer multiple files, it is more suitable to consider using specialized FTP Clients, ideally including security features. In the browser's Address field, enter the server address. In the opened window, you can see folders and files on the server, having the same appearance as in Windows Explorer. The procedures of downloading from the server and uploading to the server are the same as working with files on disks. Open your disk in a new window. Drag and drop files or use the Copy and Paste commands to transfer files to or from the server. If the server does not allow anonymous login, a window is displayed requiring you to enter your login information. If the server allows anonymous login, but you want to login with your information, use the File menu - Login, or click the empty space between the folders, right-click the mouse and choose "Login..". If the FTP mode is required to be defined, go to Control Panel - Internet Options. However, the options are limited and the default settings are usually sufficient. In the Advanced menu, you can disable the Passive mode and the "Enable folder view for FTP sites" option. 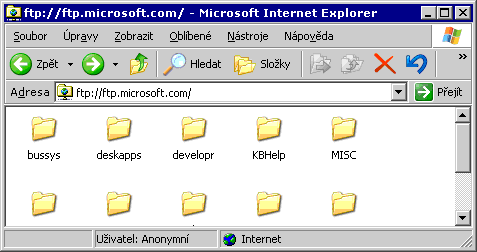 In the IE7 test version in Windows Vista, FTP did not work in Windows Explorer (at the time of writing this article). When trying to use Windows Explorer, all FTP attempts ended up with an error message: "This FTP Site Cannot Be Viewed in Windows Explorer". Everything should work in the final version. Displaying options similar to IE7 you may know from some other browsers or older IE versions. The browser displays files and folders as a web page with limited options - you can only view the content of the FTP server and download files. Upload to the server is solved in IE7 by combination of Internet Explorer + Windows Explorer. The competition's browser Mozilla Firefox provides similar features. To get a full FTP program, you need to download a plug-in module, e.g. the well-known FireFTP. If you require the text mode, enter ftp.exe in the command line. Placing commands is slower and a bit more complicated which can be a disadvantage. After having connected, information about the server name, company name or others may be displayed. Some servers require users to keep the rules stated in this information dialog or on a website mentioned there. Firewall - In case your computer uses firewall or proxy server, the connection to an FTP server may be unsuccessful. Ideal solution is to try to connect to another network, and if it works, turn to your network administrator or Internet provider. Note! This can also be caused by your Personal Firewall or a device in your company or home which blocks FTP. Passive vs. Active Mode - Comparing the Active to the Passive mode, the Passive Mode is more secure, as two communication channels are used for the transfer - one for the management and the other one for the transfer itself (port 20 in the Active mode). 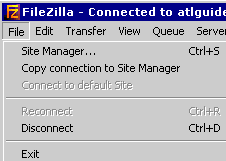 The transfer in the Active mode connection opens on the server's side (towards the Client). In the Passive mode, the data transfer opens on the Client's side (from the client). Binary or ASCII - Latest Clients define whether data will be transferred in Binary (0s and 1s transferred in bytes) or in text form (ASCII) themselves. ASCII is usually used for communication with the server and for control commands, while Binary mode is usually used for transfers themselves. Theoretically, text files (*.txt, *.html) should be transferred in the ASCII mode.